In 2010, Arsenals former home at Highbury Stadium was converted into luxury apartments. As a listed building, Highbury had to retain key architectural features in the transition. One of these was Arsenals iconic cannon logo, a large stone sculpture around 4 m wide by 2 m high. EPS were commissioned to create a full-size replica of the original cannon logo. It was to use modern construction techniques, but blend in seamlessly with the original elements of the building. 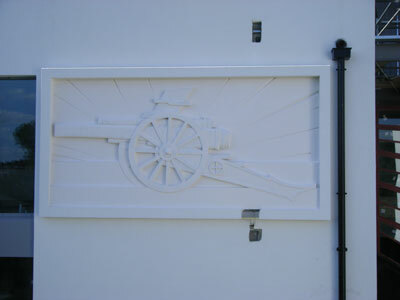 We started by creating a smaller scale replica of the Highbury cannon logo to seek client approval. Once we had the go-ahead, we were able to create a full-size version of the logo in just a week and a half. The logo was a lot like a jigsaw, with lots of different parts cut to shape and built up in layers. When the shape was finished, the whole logo was spray-coated with a two-part epoxy coating. This water-based finish ensured the finished logo would be totally waterproof. Finally, the Highbury logo was painted in the classic Arsenal colours!